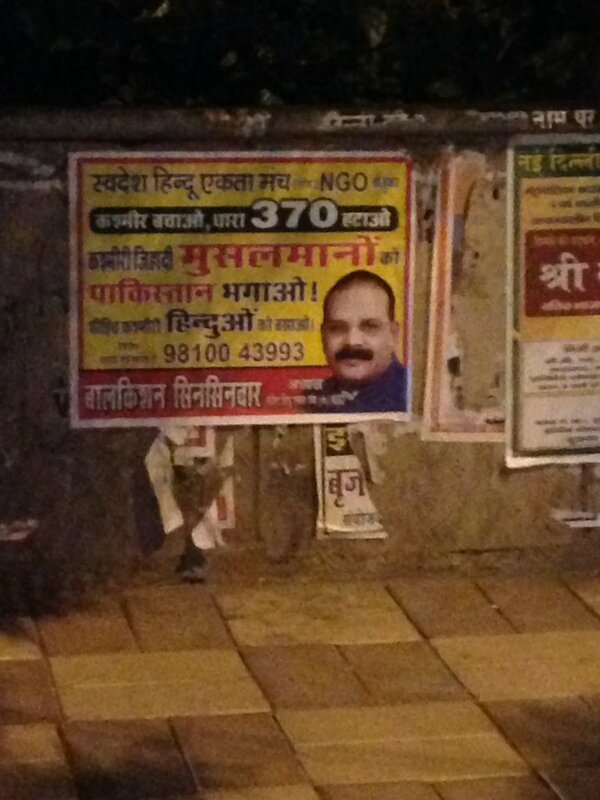 The ‘Swadesh Hindu Ekta Manch’ Poster says, Drive out Jihadi Kashmiri Muslims and sent them to Pakistan. Hindus protest against Jihad in Kashmir and its network throughout India…. Hindutva Poster in Delhi Calls for Jihadi Kashmiri Muslims to be ‘Driven Out to Pakistan’and to abolish Art. 370 from Indian Constitution. Upendra Bharti | HENB | New Delhi | July 7, 2018:: As a reaction of stone pelting on Indian army by Jihadi youths in Kashmir valley and obviously as a retaliation against the subversive activities of the Huriyyat, NC and PDP; a Hindutva group has put up posters in various of locations in Delhi giving a clarion call to drive out ‘Jihadi Kashmiri Muslims’ and sent them to Pakistan. Highlighting the poster’s open call to retaliate against Kashmiri Muslims – “Kashmiri Jihadi Musalmanon ko Pakistan bhagao” – some secular and pro-Pak Kishmiri groups jumped in to social media platforms to instigate the Central Govt to take measure against the people published the poster. They say, “It will be a test case for the BJP government at the Centre which has come under pressure to act against those circulating inflammatory messages on social media”. While IT minister Ravi Shankar Prasad has said WhatsApp must help the government identify and act against those hiding behind the cover of online anonymity, the Delhi poster has been issued in the name of one Balkishen Silsilwar of the Swadesh Hindu Ekta Manch and also contains his mobile number, 9810043993. When HENB contacted Silsilwar on Friday night, he confirmed he had put up the poster. As per report, the posters are now seen at many locations in Delhi. The Wire+ (a pseudo-secular and pro Islamic group in online media) narrates, “The poster has come up at a time when ordinary Muslim students and residents from the state living in different parts of the country have been subjected to violence. “In February this year, there was an attack on two Kashmiri students in Mahendragarh in Haryana+. They had gone to the mosque to offer afternoon prayers when they were attacked near Masani Chowk. Both the students, Aftab Ahmad and Amjad Ali, hailed from Rajouri in Jammu and were enrolled in the geography department of Central University of Haryana and were on their way back from the nearest mosque in Mahendragarh town, around 11 kilometres away from the university, when a group of 10-15 motorbike-borne men abused and attacked them. “Following an angry outburst from then state chief minister, Mehbooba Mufti, who through a tweet urged the authorities to investigate and take strict action, the Haryana police filed an FIR and arrested six people in connection with the violence. “Thereafter in March this year, another Kashmiri student was assaulted near Maharishi Markandeshwar University in Ambala district of Haryana+ following an argument over the issue of Kashmir with a fellow student. “Following this attack on Mudasir Ahmad of Sopore, who was pursuing an undergraduate course in radiology, the university administration ordered the suspension of one of the youths allegedly involved in the incident. “It was later revealed that the two students had entered into a “heated argument” in their hostel. The accused student had then brought in some people and slapped the victim, following which his supporters had also beaten up Mudasir. “In another shocking incident, a Kashmiri family was assaulted, allegedly by their neighbours, in Siddharth Extension in South Delhi in May this year+. While the family claimed it was the victim of a hate crime, the neighbours alleged that they got into a fight with the Kashmiri residents over their habit of feeding stray dogs. “There was, however, no doubt about five members of the family, including four women, being assaulted by a nearly 30-40 strong mob. Not only were the residents who attacked the family armed with hockey sticks, they also allegedly raised anti-Kashmiri slogans, indicating that the incident was influenced by hatred”. Actually, the pro-Pak Jihadi activism in JNU, JU, UoH for Azad Kashmir (Free Kashmir) and the memories of raising slogans like, “Bharat Tere Tukde Honge, Insha Allah Insha Allah (India will be cut to pieces, If Allha agrees”, “Afzal Hum Sarminda hai, Tera kati zinda hai (Afzal* we are ashamed as your killers are still alive)”, are still afresh in the mind of many patriots and they have already started retaliation accordingly against the people with separatist Kishimiri groups. [*Afzal Guru was a Kashmiri separatist and the mastermind of attack on Indian Parliament in Dec, 2001]. In an short interview Balkishen Silsilwar conveyed HENB that his organisation would continue their struggle to abolish Article 370 from Indian Constitution with generating public awareness not to buy Kashmiri Shawls and winter garments from Muslim Kashmiri sellers and not to allow their colony in various parts of the country in a business network. “When Hindus of India are not permitted to purchase a piece of land in Kashmir, then how we can allow their (Kashminiri Muslims) settlements and business in our states” told Silsilwar to HENB. Upananda Brahmachari, the eminent Hindu interlocutor and Editor of Hindu Existence supported the cause of Swadesh Hindu Ekta Manch (SHEM) and thanked Balkishen Silsilwar, the President of SHEM for his bold steps against the Jihad in Kashmir and its network throughout India. This entry was posted on July 7, 2018 by hinduexistence in ANTI JIHAD, Hindu Advocacy, Hindu Awareness, Hindu Protest, Hindu Retaliation, Hindus against Terrorism, Jihad in Jammu and Kashmir, Scrap Art 370 from Indian Constitution and tagged Abolish Art. 370, Balkishen Silsilwar, call to drive out Jihadi kashmiris from India, Hindu protest against Jihad in Kashmir, Hindutva Poster in Delhi against Jihadi Kashmiri Muslims, Swadesh Hindu Ekta Manch, Upananda Brahmachari.